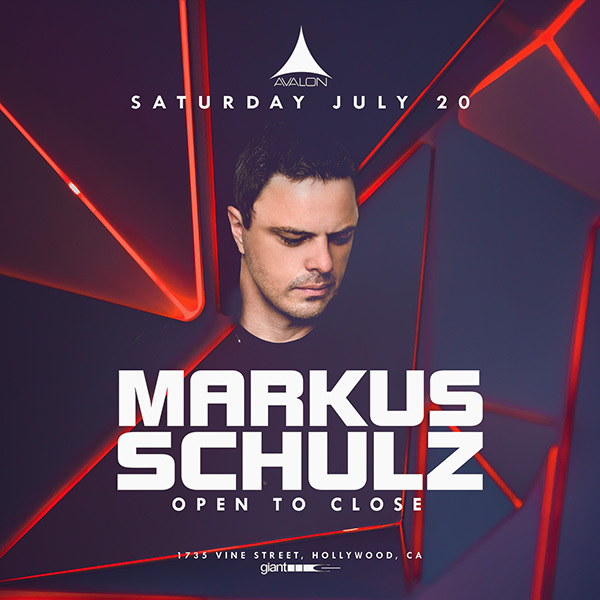 AVALON Hollywood is eager to welcome back the unicorn slayer himself, Markus Schulz, for an exclusive Open to Close Set on Saturday, July 20th. Transcending all thins progressive, trance, and house, the German DJ and producer Markus Schulz has crafted a prolific career among the electronic music community and is no stranger to the AVALON mainstage. Recognized as a three-time winner of DJ Times’ America’s Best DJ, and highly acclaimed by dance publications both at the national and international levels, Mark Schulz delivers a seamless mixing style that has had him perform around the globe. Following the release of his latest single ‘Heartbeat’ in collaboration with ATB, Markus Schulz unites sweeping vocals and infectious melodies; testament to the DJ’s anthemic sound. With an abundance of club hits the producer has graced the stages of EDC, Ultra, Tomorrowland, and many more. AVALON is ecstatic to host Markus Schulz and his exceptional curation skills as he delivers one of his stylistically acclaimed open-till-close sets. You won’t want to miss this special occasion.